Through its exclusive relationship with Twitter, Microsoft said its Bing search engine will provide a front door into Twitter’s timeline. It’s unclear, however, whether the company will be able to provide greater detail than what Twitter—or for that matter, Google—will provide. 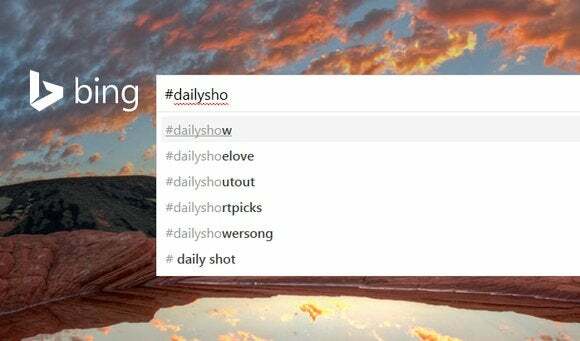 Microsoft said that it is rolling out an update to the Bing search engine that will quickly autosuggest users and trending topics as users type the name inside the search box. Begin typing "@a," for example, and Bing will autosuggest "@aplusk," the handle of actor and investor Ashton Kutcher. And if you begin your query with a "#" hashtag, you'll be able to quickly find tweets on the topic, such as the "#USMNT" abbreviation for the U.S. national men's soccer team. Bing also said that it will show you related tweets about a given topic, as well as news about that topic or person that was shared on Twitter. Microsoft has made Bing a social destination, tapping into a number of social sites including LinkedIn, Yelp, and Facebook. Searching for a particular person, for example, will often bring up a search "card" with biographical information and links to that person's social feeds. What's less clear, however, is whether or not users will be able to use Bing to plumb the murky depths of historical tweets. One of the problems with Twitter is that, while it has been easy to discover current tweets and trending topics, it's much more difficult to go back to say, the last World Cup four years ago, and re-discover what fans were talking about. And that apparently won't change. The Bing team, however, implied that "fresh" current events are what it will focus upon. "The central idea behind the approach is that the most interesting content on Twitter can be determined by a combination of a tweet’s popularity, its freshness and the authority of the user tweeting it," the company wrote. "We look at a number of signals including tweet quality, retweet count, freshness of tweet, user profile info and verified status, among others. Placing these signals in our model, we serve what we hope are top quality tweets." A Microsoft spokesman said via email that the announcement "was focused on how Twitter surfaces within Bing." In 2011, Twitter said it needed just 20 terabytes to back up every tweet in existence to a new data center. In the three years since then, dozens of terabytes have probably been added. The point, though, is that even through the volume of tweets is relatively small in capacity, there is really no good way to sift through the world's archived tweets. Hopefully Bing can change that.